Guest: "So where do you live?" Guest: "I was told not to go there." I have exchanges like this from time, usually from first-time visitors, concerned about their safety in New York City. This a very valid question. And I always reassure a client that a) yes, it is very safe, but also b) exercise basic street smarts anyway (don't carry your wallet in your back pocket, be aware of surroundings, just ignore street solicitors or hawkers, don't buy anything from a guy on the street who doesn't have a valid street vendor license, etc). For many who've never been to NYC before, the city's image & reputation was cemented, then frozen in time, by movies of the '70s and '80s like "Midnight Cowboy", "Taxi Driver", or "Serpico" that depicted the Big Apple as a grimey, crime-ridden hellhole. Not to mention movies like "Escape from New York" or the original "Planet of the Apes" series that literally depicted the city as dystopian wastelands. But that is long past. Today, in Coney Island, you will encounter chain restaurants, shiny new amusement parks, and rising tourism... not the world of "The Warriors". Of course, in those two decades, while people were continuing to live here and thrive and raise families, New York City was its lowest point in terms of crime and economic health. This was an era of 'white flight' from major cities. 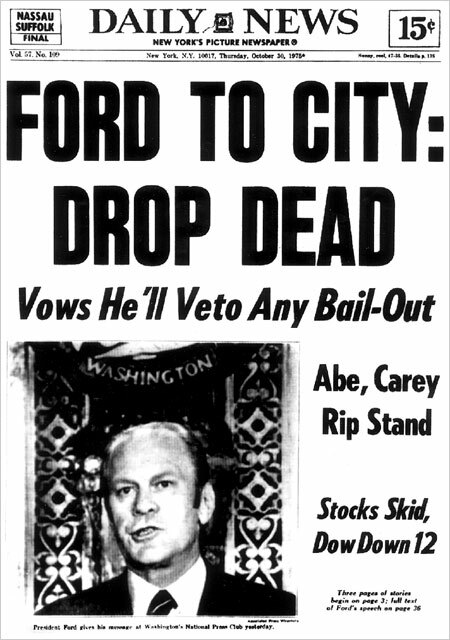 Things were so bleak that, in 1975, the city nearly went bankrupt. This saga was immortalized in the most iconic NY Daily News cover ever. You usually can tell easily in some neighborhoods who the oldest residents are by who has bars on their windows. But the New York City of today is a reversal in almost every way from that era. Today, New York City is seeing so many people coming in (not fleeing out), most of them wealthier than average, that keeping the city a place where the working class can even afford to remain is the #1 political issue. The city is awash with people, wealth, greenery... and it's also the cleanest it has ever been. New parks and skyscrapers are cropping up like daffodils in the Spring. Some people now are even so turned off by these changes, that they romanticize the past era of New York City (aided by hauntingly beautiful photo essays of its gritty past). And crime? Despite the rhetoric we often hear (and people's memories of the past), crime in America as a whole, and NYC in particular, are at all-time record lows... and dropping. As a tour guide who cares for the safety of my visitors, I would never recommend any neighborhood that I worried would not be safe for them. And I can only count on one hand the number of neighborhoods I would, today, decline to recommend for that reason. Boroughs like the Bronx and Brooklyn have so much to offer visitors to the city, even first-timers... historical homes and museums, botanical gardens, zoos, parks, sports, and much more (including the real Little Italy). Go forth and discover them! Today, Brooklyn, as a borough and a brand, is so popular that it is a top baby name. And yes, they are very safe. When they are opening up Brooklyn-themed bars in Paris, you know you have nothing to fear. Want to see for yourself? I would love to show what you've been missing.